CBS Television Tests the Water With "SHARK"
RANCHO CUCAMONGA, CA -- (MARKET WIRE) -- August 3, 2006 -- AquaCell (OTCBB: AQUA) announced today that CBS Television, which has historically captured water cooler buzz for its comedies by advertising on Aquacell water coolers installed in retail stores, is diving into uncharted waters by promoting its new prime time drama "SHARK" starring James Woods, on AquaCell's water coolers installed in law offices. "We're thrilled CBS is expanding its Coolertising™ program beyond the retail stores by advertising on coolers installed in lawyer's offices," said Karen Laustsen, President of AquaCell Technologies. "Lawyer's offices are the perfect place for CBS Television to promote 'SHARK.'" This latest Coolertising promotion encourages those that are thirsty for something different to "Try a Cooler Courtroom Drama." The program includes promotion on hundreds of water coolers installed in retail locations in the New York and Los Angeles areas, as well as law offices in the Mid-Atlantic region. AquaCell's exclusive "Coolertising" advertising program provides unique "out-of-home" advertising. 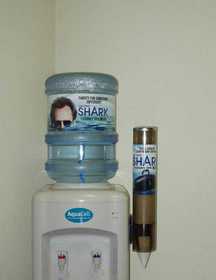 The Company installs its patented self-filling AquaCell Bottled Water Cooler System into various locations free of charge under a multi-year agreement and retains ownership of the "billboard" water cooler. Revenue is generated through the sale of the advertising space on the bottle band and cup holder of the permanently attached five-gallon bottle to companies that provide products and services pertinent to the demographics and location. CBS Television is comprised of the CBS Television Network -- with over 200 owned and affiliated stations reaching virtually every television home in the United States; the Network's programming arms CBS Entertainment, CBS News and CBS Sports; and CBS Enterprises, a global leader in distribution.